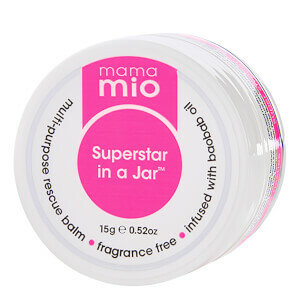 Stay cool, calm and collected throughout your pregnancy with the Mama Mio Way to Glow Facial Spritz; a convenient, travel-friendly mist that hydrates and protects the visage with one simple spray. Effortlessly spritzing over the complexion, the comforting formula is enriched with Aloe Barbadensis Leaf Juice, which is the perfect remedy for hot, fatigued and hormonal skin. This delivers a cooling sensation that relieves feelings of irritation and leaves skin thoroughly revitalised. The facial spray is also infused with Hyaluronic Acid and Hibiscus Flower Extract, which work in synergy to hydrate the complexion, whilst calming and visibly smoothing skin for a plumped effect. Fermented Bamboo Leaf Extract and Silk Proteins combine to shield skin from external agressors, providing a protective barrier to ensure the face is radiant and enviably glowy. Complete with Gravida, a blend of ten, pregnancy-safe natural oils, the spray is finished with a delicate scent, which is uplifting to even the most delicate of pregnant noses. Leaving skin radiant and dewy, the Way to Glow spray is perfect as an energising pick-me-up throughout the day.